Fort Ad Pays Review – Is it a Scam or Legit? Pedro Fort launched Fort Ad Pays in November 2015. He is also the CEO of MLMShop.net, which was launched in 2015. If you checked his LinkedIn profile, Pedro lists his location as Columbia, which is probably where FAP is being operated from. 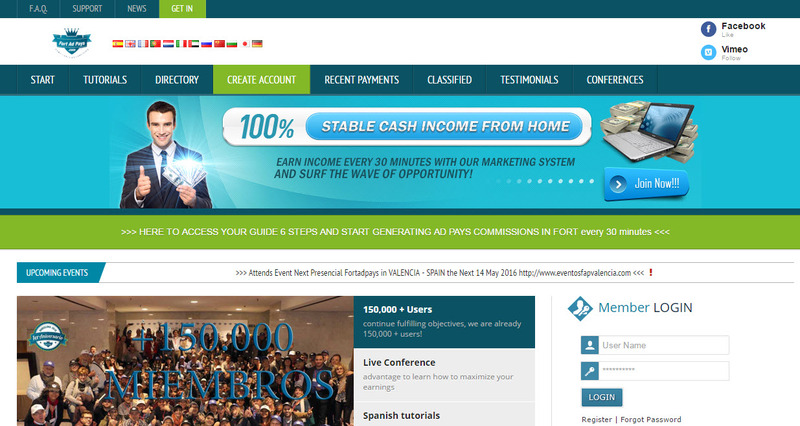 Fort Ad Pays started as a Spanish online advertising company and didn’t gain any recognition. With the passage of time, Pedro starts targeting all across the world, and now it is growing very fast. If you check its stats on Alexa, then I am very surprised to see its global rank of 6001. FAP provides advertising services in the form of Login Ads, PPC Banners, PTC Advertisements, Text Ads and Banners Ads to its customers. Moreover, similar to other revenue sharing platforms, it also offers revenue sharing facility to its members. FAP is free to join for everyone, and it is available to international members. After creating your account click on the English flag to get the English version of this site. Your next step is to deposit your account with as much money as possible for purchasing their ad packs. Revenue Sharing – To participate in FAP revenue sharing model, you need to buy their ad packs. Each pack cost is $1 and as a return, you will get $2.20 return on investment (ROI). There is no daily limit about how much you earn as it all depends on the sales made by the company. Moreover, to participate in the daily revenue sharing, you must surf eight ads every day. Your $2.20 will be split into two parts. 110% share will be moving into cash balance and 110% transferred to repurchase balance. This is to ensure the sustainability of the system. If you don’t still grasp it, then let’s look at the following example. Let’s suppose you invest $100 when it expire, you will get 110$ into your cash balance (money that you can withdraw), and $110 into your re-purchase balance (money you can use to purchase more shares). How long a share take to reach its maturity level? This is the most important question and most people also concerned about this. There is no time frame given as it all depends on the sales made by the company. On average, people are getting daily 0.6% to 1.8% commission on their investment. 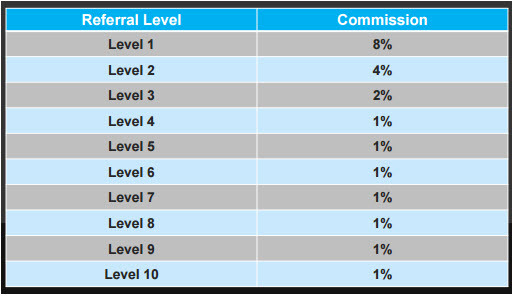 Affiliate Commission – If you are not good at recruiting new people then this is not for you. I know most of the people struggled to get this, but if you know this art, then FAP offers ten levels deep affiliate program that commutatively pays 21%. If you have a large team and they also have a downline, then this can add up. The only shortfall of this commission model is lower rates offered by the company. If you can risk your money then, this site is for you because you don’t need to do anything apart from daily clicking few ads. Just invest your money and see how it will grow. You can raise even more money by using the power of compounding. The thing is by doing this a person falls in the greed and at the end lose his/her original investment. My sincere advice is if you are investing in this venture then withdraw your initial capital as soon as possible and play with the profit earned. This is the most common thing, and I have also written with other same revenue sharing program. It is very obvious because how they are paying 220% without having any genuine product. Advertising is the most common product that such companies offer but everyone know that if they don’t offer revenue sharing facility then who will buy this product because of inferior quality. The biggest name that comes to my mind is Traffic Monsoon. It offers $50 ad pack that will mature into $55, which means the ROI by only 110%. Moreover, it is even difficult to get compounding because it takes much time to reach your balance $50, so you become eligible to purchase another ad pack. While in FAP not only you are getting high ROI but also been able to get the most of the compounding effect. This is because your balance will reach $1 very quickly and you can buy a further share. The company has no solid income-generating opportunity other than getting new investment from people buying shares. This is purely a Ponzi scheme, and you are risking too much for your money. FAP is a revenue sharing site that has been paying more than one year. In this way, it is not a new company, but the real trust comes in when it will be more than three years old. In my opinion, it is still operating as a pure Ponzi model and all new investments are utilize to pay the old debt. As long as, new members are coming then the site is growing well, but I would not suggest anyone to invest in this risky venture. If you still want to be going for it then don’t put all your eggs in one basket. These sites have a lifespan of 3 months to 2 years. You don’t know when will this period come, and you will repent after that. If you are looking for an established program that will generate a full-time income for you, then see my #1 recommendation here. It is not a passive income opportunity but requires your constant effort just like your personal business. It takes time but it has far more rewards than any other businesses.